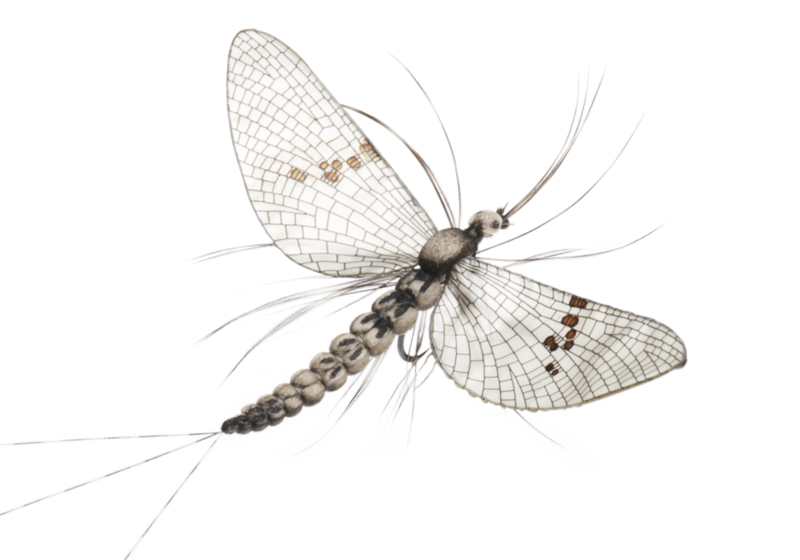 As the new hatched mayfly called Dun, progress and matures, it goes into a stage called Spinner. As a spinner they are not only able to mate, they also turn darker in colour. You can easily imitate any Spinner by using a darker coloured Dun imitation from the J:son series Mayfly Dun. After the female has laid her eggs she will die and fall down on the surface with the wings spread out on each side of the body like a krucifix. This final stage is callad Spent Spinner and these dead mayflies are an easy target for the fish. When trout feed on spent spinners they do it with comfort. These dead mayflies will not fly away or move. The rise is slow and easy going, often in an head-and-tail style. Many anglers find it diffucult as the fish turns selective during times when hundreds of Spent Spinner’s lies across the surface. To succed and maybe hook the trout of your life, you will need to observe how the fish moves, were it feeds and make a good presentation. But as important is that you use a good imitation. The fish has alot of time to observe the fly and will not take a poor imitation.